Burlington High School is pleased to announce that, following three rigorous afternoons of auditions last week, the casting is complete and the Tony award winning Broadway production, Titanic, the Musical, will set sail at BHS on March 19-20 & 26-28, 2010! Based on the true story of the ill-fated luxury liner, audiences will witness the lives of characters who were actual passengers on board the fated ship. With music and lyrics by Maury Yeston and libretto by Peter Stone, this is not the love story seen in the movie. Theatre-goers will find themselves immersed in a range of emotions from great anticipation and excitement, to panic and grief as the voyage turns tragic. 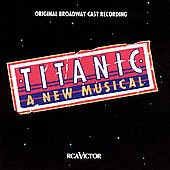 Titanic's creative team is a proven winner with John Middleton-Cox as Director/Producer/Co-Music Director, Stephanie Diozzi as Assistant Director, Amanda Potts as Co-Music Director, Leanne Reardon as Choreographer, Shannon Janovitz as Production Manager, Peter Waldron as Set Designer and award-winning costume designer Maureen Tierson-Krebs. Mark your calendars now. As with all other BHS musical productions, Titanic, the Musical will sell out. More details to follow after the first of the year! To learn more about the BHS production of Titanic, follow the production's blog at http://bhstitanic.blogspot.com.